Applications: Street, Drag, Pulling, Autocross. This unit is a solid hub version of the stage 3. The hub is solid 8-rivet and the assembly is heat treated for strength and durability. It is available in a 3, 4 or 6 puck configuration. Use the 3 puck for the lightest option or the 6 puck for the smoothest engagement. The 4 puck is a good compromise for both. Street drivable in 6 puck configuration, but not street friendly due to the rigid hub. Best for drag racing, road racing, pulling, rally and drift. Includes bearing and tool kit. 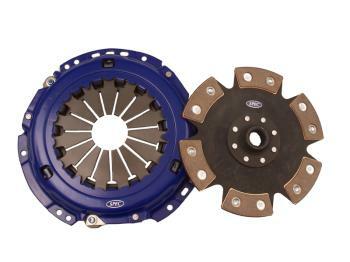 (application dependent) Remove additional rotating mass with Spec lightweight clutch option for $79. !